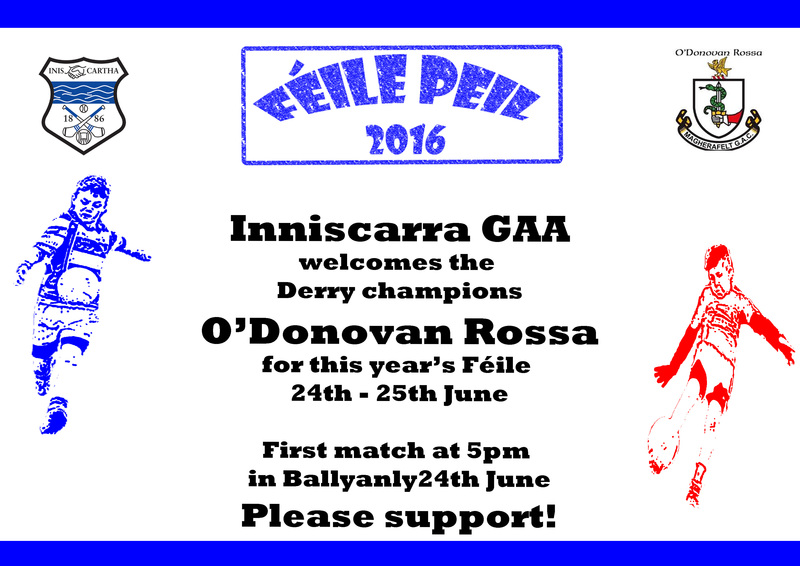 Inniscarra are delighted to be taking part and hosting Derry champions, OâDonovan Rossa in this yearâs national FÃ©ile Peil competition (U14) which will take place 24th â 26th June. FÃ©ile will be the biggest youth sporting event in Europe in 2016 and will take place in South West Munster with clubs from West Limerick, Kerry and North Cork hosting visiting teams. It is expected that teams from Europe and America will be make up c. 160 boys teams participating in the competition. OâDonovan Rossa will bring 33 players who will stay with host families for the weekend and both clubs will play a minimum of four games over the weekend. This is a great opportunity for our U14 team to take part in a National Football competition and it also gives all involved the chance to make new friends. It promises to be a great weekend of football and we ask you to support the boys throughout the weekend. 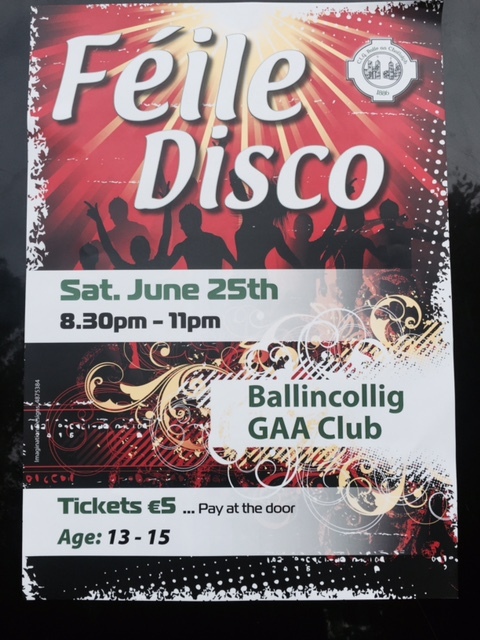 On the Friday night (24th June), the club will host a night of entertainment for everyone starting at 8pm in Ballyanly. There will be long puck, tug of war and long kick competitions as well as chip vans and ice cream vans and much more. It will be a great evening so come along and support the club, meet our visiting club and welcome them to the area. On Saturday, both teams will take part in a parade in Carrigaline and then head to a disco in Ballincollig. 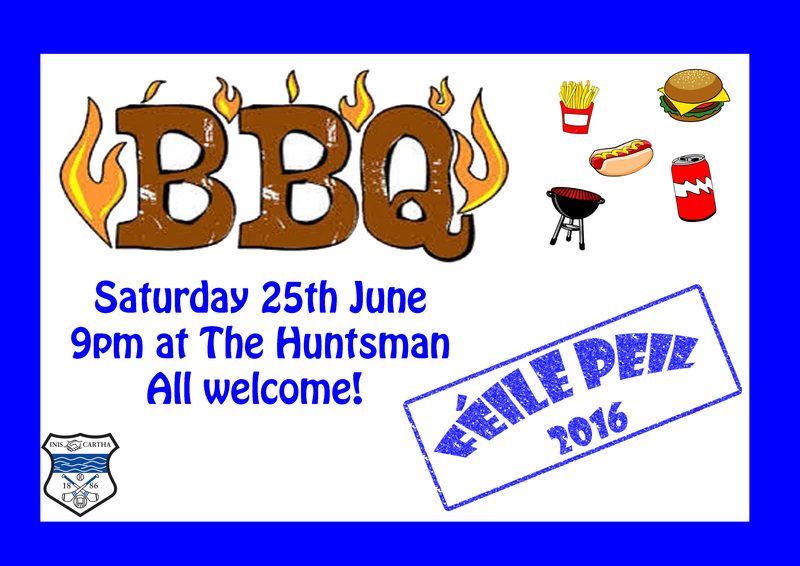 While the boys are at the disco, everyone is invited to a BBQ in the Huntsman. Starting at 9pm, there will be plenty of food and entertainment for all!